Can you Spice it up a bit ? Xperience the BEST Salsa Night in Bangkok and show your skills all night long ! Workshop for early birds, beginners don’t be shy we take care of you ! 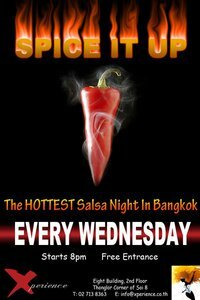 See you @ Xperience, Thong Lo Soi 8 EVERY WEDNESDAY for the HOTTEST Salsa Night in Town !